Twas the night before Statesmas and everywhere is quiet! So the craziness of the final day before racing commences in a few hours has abated and the village of Squaw Valley has finally fallen silent. At the Top 10 parade this afternoon you could cut the tension with a knife. Late betting pushed Hal Koerner into a strong podium finish and the two time winner was certainly looking the part with a new beard of some description! The impressive European contingent including Jez Bragg and Ian Sharman quietly went about their business. After our meeting with Tim Twietmeyer this morning we were struck at how much time he has for everyone associated with the sport. So it was great to see him awarded the Little Cougar trophy for services to the race. The standing ovation given by the 1000 plus onlookers was extremely genuine to a true great of the sport. The entourage that followed him around at the North Face 100 in Australia was diluted somewhat here by the huge US juggernaut that is Roes, Koerner, Mackey, AJW etc. 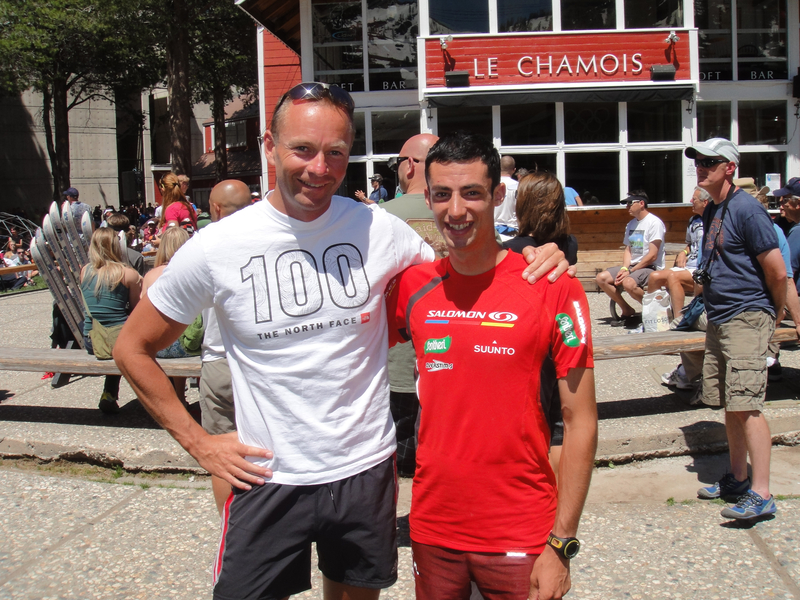 This is probably refreshing for Kilian who has probably one of the toughest race schedules of all and happily takes it all in his stride. Kilian is being paced by Simon Mtuy and Rickey Gates. Simon we all remember from the Kilian Quest videos of his record attempt on Kilimanjaro. Simon was the previous record holder before Jornet snaffled it. So this will be the last pre race post and the next time you hear from us Andrew will be off and running. Andrew receives a final pep talk from a LEGEND!